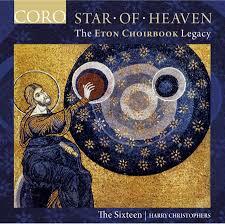 The Sixteen have been champions of the Eton Choirbook for years. Here is a thoughtful juxtaposition of some of that wonderful polyphony with contemporary works commissioned through the Genesis Foundation. Beginning with the beguiling simplicity of the plainsong Nesciens Mater, we are treated to the long arcs of Walter Lambe’s setting of the same text, contrasting with James Phibbs’s poignant homophonic treatment. One of the highlights is Phillip Cooke’s rhapsodic riff on William Cornysh’s sombre Ave Maria, Mater Dei. Cooke uses two off-stage sopranos interacting with the main choir to create an ethereal sound world that conjures up the lost world of Tudor music. In the middle of this garden of musical delights stands James MacMillan’s O Virgo Prudentissima, in which the composer uses a wide variety of textures and techniques including humming to produce a colourful music tapestry with a considerable number of technical challenges. In the reverberant space of St Augustine’s, Kilburn, the singers acquit themselves well, delivering an atmospheric account. Marco Galvani’s response to Lambe’s Stella Caeli has a certain harmonic austerity that works well with the text, a prayer from deliverance from plague. Robert Wylkynson’s glorious Salve Regina brings us to Stephen Hough’s Hallowed, which uses texts from different faiths to provide an interesting counterpoint to this otherwise Catholic and Marian program. The Sixteen shine in their fifth album exploring Polish music. The English conductor gives his take on whether the French composer was rascal, monk, or both. Harry Christophers discusses the act of creation. A pioneering recording offers a fascinating window into the musical world of Henry VIII’s controversial second wife.